268mm Square Antique Type Frame with 150 mm round waxed and burnished terracotta plaque centrally mounted in un-glazes frame. 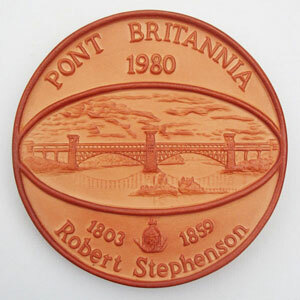 This series of plaques are unique products made in Wales. Only available while stocks last. Price per framed plaque.Mounted in a 268mm Square Antique Type Frame with 150mm round waxed and burnished terracotta plaque centrally mounted in frame. 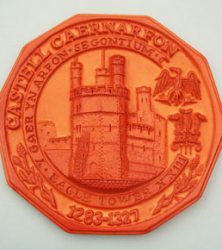 This series of plaques are unique products made in Wales. 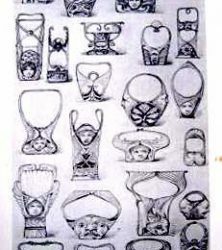 Designs are copyright, date-stamped, patent and manufactured by MRM 1989. Only available while stocks last. Priced per framed plaque.These plaques are very special to me I designed and made them for 25 years. North Wales is blessed with history. I was fortunate to add my small part to it. Last framed plaque. Last few Â£25, last keyhole remaining. Production ended 10 years ago. Image colour may vary, due to hot waxing and burnishing.